Our Double Six Color Dot Dominoes Sets include 28 color dot dominoes inside a durable canvas storage portfolio for safe and organized keeping. These Color Dot Domino Sets include domino game rules for three popular domino games (Block, Muggins, Mexican Train). Each Domino measures 1-7/8" Long x 1" Wide x 1/8" Thick. 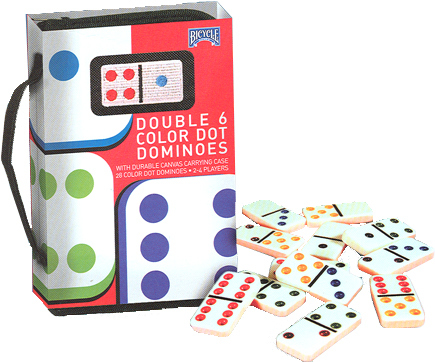 For additional information on our Double Six Color Dot Dominoes Set, please contact us at 1-800-233-0828. Feel free to browse our other Games including, Checkers, Go Game Set, and our popular Pokeno Game Sets.